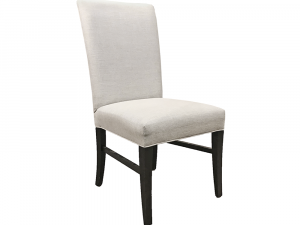 Sophisticated and simplistic, this dining chair is comfortably padded for every day use and elegantly designed for dinner party attire. Alternate finishes available at no additional cost. 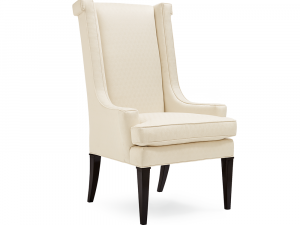 Crafted with wood and covered in a supple fabric with a tufted back. Available to order in alternate finishes, fabrics and leather cover options. 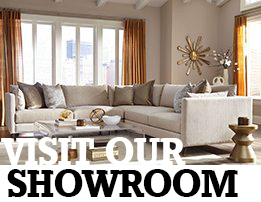 Please call, email or visit us in-store to inquire. 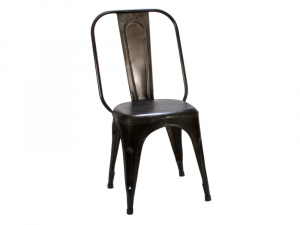 Bring home unprecedented industrial style with this bold architect chair. Featuring a sleek metal frame in black coral, paired with a cushioned seat in a gorgeous stratus fabric, the chair boasts a creative aura in a harmonious contrast of clean lines and distressed accents. 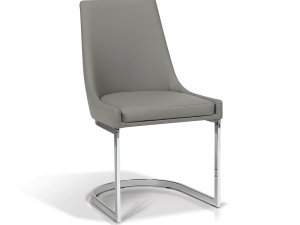 Available to order in alternate metal finishes, fabric cover options and wood seat finishes at no additional cost. 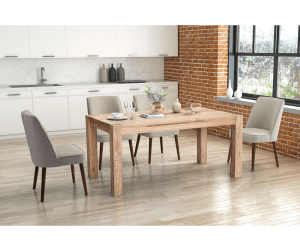 Modern and simplistic, this comfortable dining chair is an easy way to bring contemporary style to your dining room or kitchen. 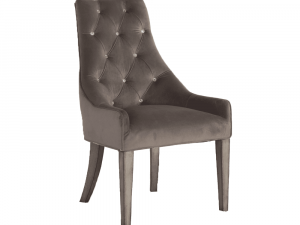 Upholstered in Grey faux leather. 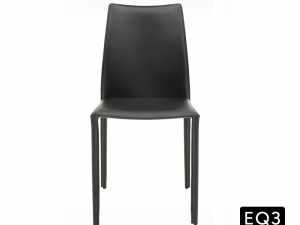 Also available to order in faux black leather. 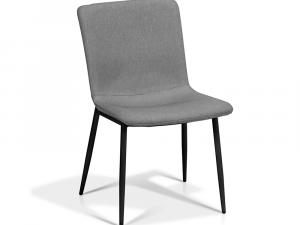 A sleek, urban designed dining chair featuring bold vertical stitching on the seat and back, for a distinguished retro look. 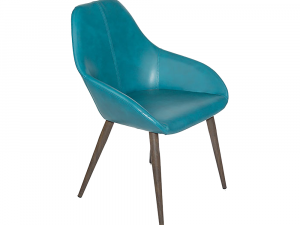 Vintage blue faux leather, rustic bronze steel frame. Frame available in standard rustic bronze. Upgrade to polished stainless steel cantilever frame for $100. Vintage cognac faux leather, rustic bronze steel frame. 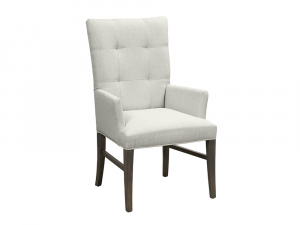 Simple and sleek, this beautiful accent chair will highlight any traditional or contemporary space, making it worthy of a standing ovation. 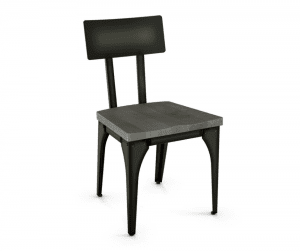 Features semi open slatted wood back. 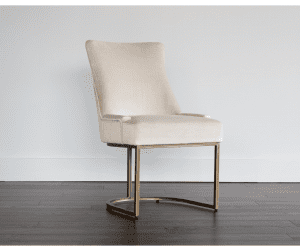 Seat upholstered in luxurious beige fabric. Available to order in alternate fabrics and finishes at select pricing. Crafted with cathedral primavera burl. 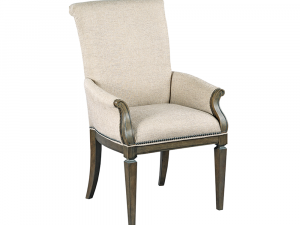 Classically designed Arm Chair with stunning semi-open carved wood back and upholstered seat. 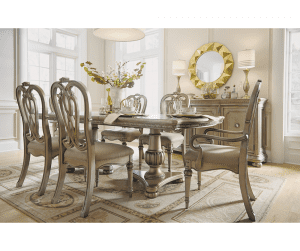 Add luxurious charm to your home with the intricate wood carvings and metallic accents of this gorgeous collection. 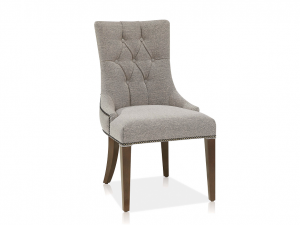 Classically designed upholstered chair with contrast welt. 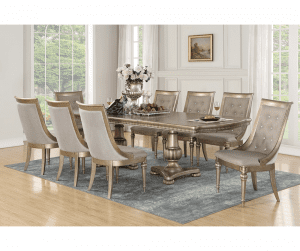 Features crystal like glass tufting. The right shape in Italian design. 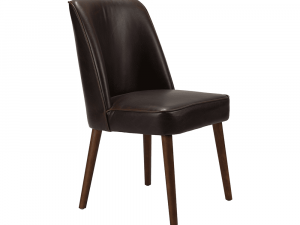 Sleek leather chair versatile as a dining side chair or accent seat. Conical metal grey lacquered leg for unforgettable presence. 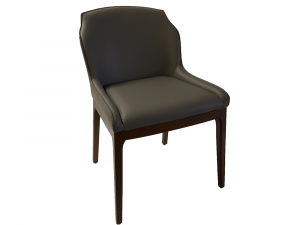 Shown here in light pearl grey leather with dove grey piping as displayed in-store. 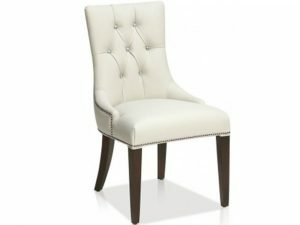 Available to custom order in white leather with dove grey piping at no upcharge. Additional custom leathers available with $100 upcharge. 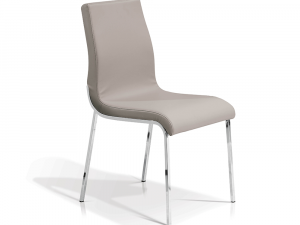 Leather seat in light pearl grey with dove grey leather piping. CUstom leathers available to order with $100 upcharge. 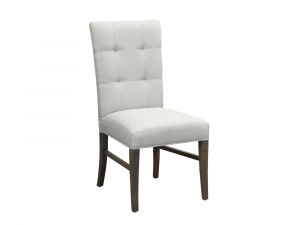 This stunning dining side chair combines sophisticated style with modern day pizzaz. 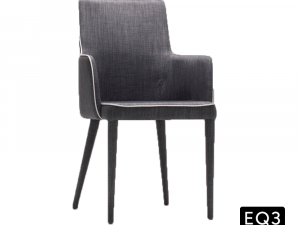 Featuring a stylishly breathtaking charcoal grey fabric cover, highlighted by chrome finished legs, this chair radiates a unique aura wherever it goes. 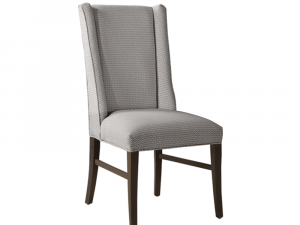 This astute dining chair brings distinctive style to any setting. A set of four retro-styled dining chairs with a touch of cosmopolitan glam that will work in almost any dining room setting. 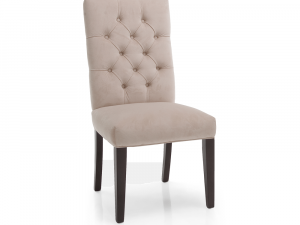 Each chair’s shaped back is tufted, giving it a classically chic look with wide appeal. Upholstered in white fabric with taupe sheen, matching buttons. 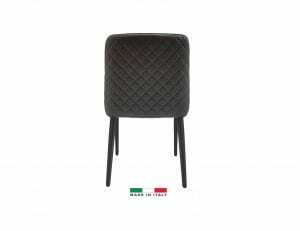 Clever and contemporary with quilted back design in gorgeous wrap-around leather. Shown here in anthracite grey leather as displayed in-store. 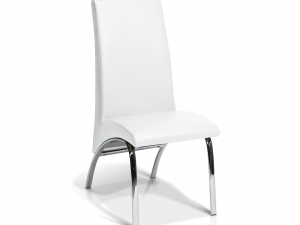 Available to custom order in white leather at no upcharge. 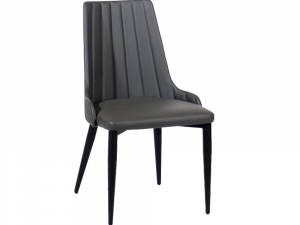 Leather seat in anthracite grey leather. 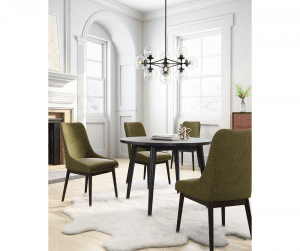 Because a classic piece never gets old, this timeless dining chair has transcended years of trends and fads, and will continue to to stay relevant even as your home decor changes. Alternate fabrics and finishes available at no additional cost. 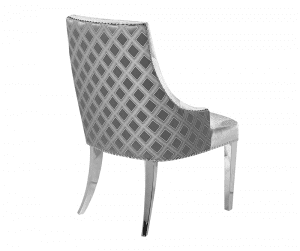 Available to order in hundreds of fabrics and finishes. Alternate fabrics finishes available at no additional cost. 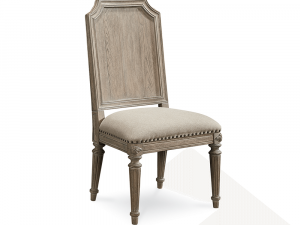 With sweeping carved woodwork, and a classically French carved frame, this gorgeous chair is perfect around a table or standing alone. 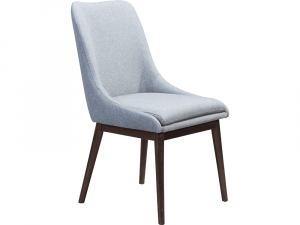 Wood frame with upholstered seat and oval back. Fluted tapered front and sabre back legs. Gilded in Auric silver leaf. 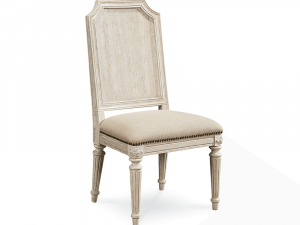 This classically French carved Dining Chair is the perfect chic addition to your dining room. 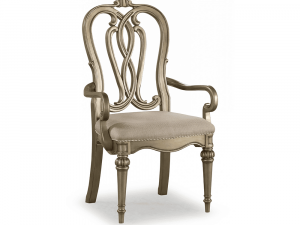 With sweeping carved woodwork in a divine finish, the chair is accentuated by its fluted tapered legs and makes for a comfortable piece with elegance all its own. 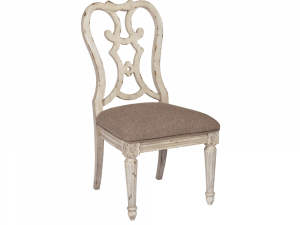 Wood frame with Ivory upholstered seat and oval back. As advertised pricing applicable online and in-store, while quantities last or April 22nd! 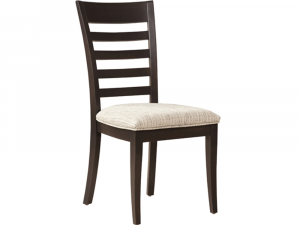 This modern barrelback dining chair sits comfortably in any contemporary setting. Features a large cutout in the seatback. Wood legs with stainless steel accents. 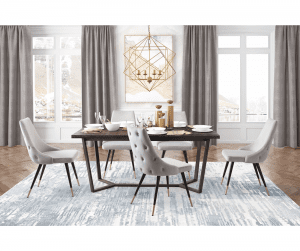 Upholstered in an incredibly soft and supple fabric, this elegant Dining Chair is the perfect way to add classy, comfortable style to your dining room. 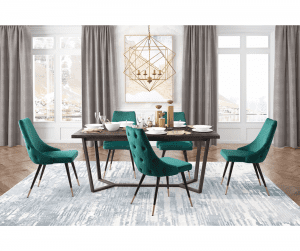 Features acrylic legs and dark teal fabric. 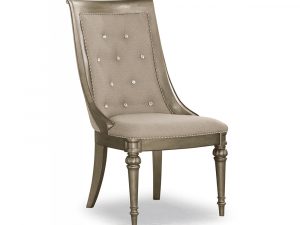 Fashionably chic, this gorgeous side chair will have your family and your guests feeling like they’ve stepped into a black tie ballroom. 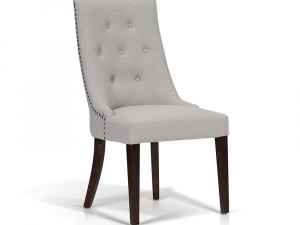 Exhibiting a unique design with hardwood construction, the chair features exquisite fabric upholstery with button tufting, sleek legs in a slate grey finish; lending effortless class and sophistication to any home decor style. 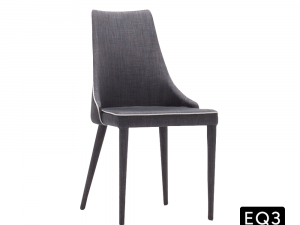 The fluid curves and elegant movement of this dining chair lends chic style to any modern or contemporary living space. 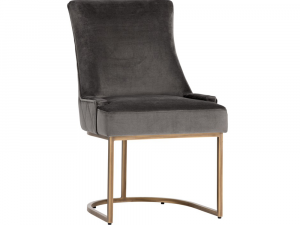 Crafted with a sturdy steel frame, in a shimmering chrome finish, the seat and back are upholstered in a faux black leather, and can be customized in dove grey and white faux leather or in vision pepper fabric at the featured special buy price! 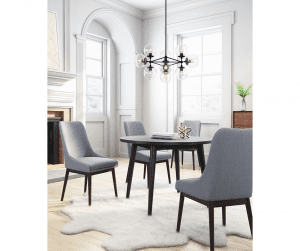 Crafted with a sturdy steel frame, in a shimmering chrome finish, the seat and back are upholstered in a faux dove grey leather, and can be customized in white and black faux leather or in vision pepper fabric at the featured special buy price! 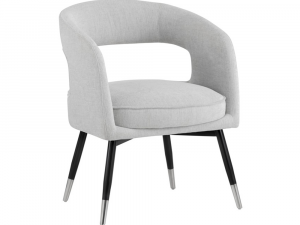 Crafted with a sturdy steel frame, in a shimmering chrome finish, the seat and back are upholstered in a faux white leather, and can be customized in dove grey and black faux leather or in vision pepper fabric at the featured special buy price! 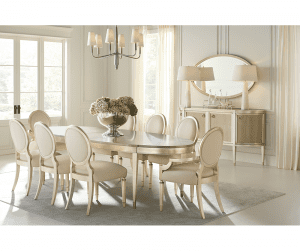 Enrich any modern dining room with contemporary style and luxurious design. 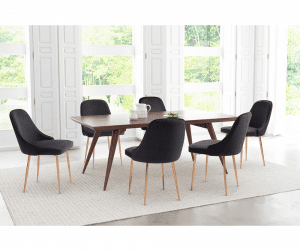 Built with a sturdy metal frame in a shiny chrome finish, and a comfortable padded seat upholstered in a black faux leather, the chairs simple yet elegant stance makes it an effortlessly perfect addition to your home. 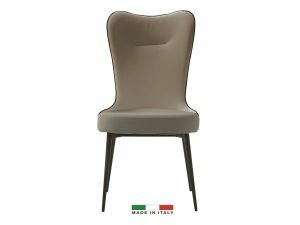 This sleek Italian made Dining Chair offers modern European style to your decor, while providing comfortable seating for casual and semi formal occasions. 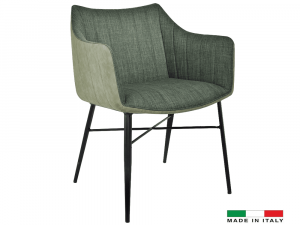 Upholstered in a Dark Green fabric front with a Matt PU back. Crafted with a metal frame. Also available to order in Navy Blue or Lime Green fabric at no additional cost. 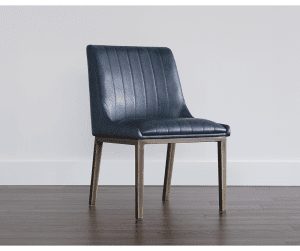 Upholstered in a Navy Blue fabric front with a Matt PU back. Also available to order in Dark Green or Lime Green fabric at no additional cost. 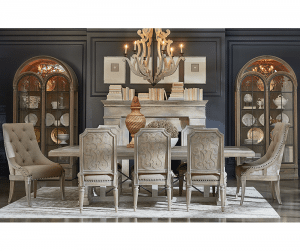 Pure and refined, with exuberant details, this exquisite Louis Philippe-style dining chair brings elegance into any space. Upholstered in a gorgeous patterned fabric with accent nailhead trim. Small pewter nailhead detailing and espresso leg. Available to custom order in-store in hundreds of fabrics and patterns to choose from at select prices. 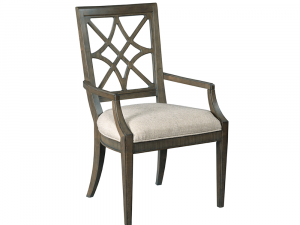 Alternate leg finishes in fruitwood, espresso, black, pewter, graphite or cream finishes at no upcharge. Nailhead detailing in antique brass. brass. graphite, gold or nickel. Tapered legs and intricate back design. Elm frame, Blackwood desert fabic. 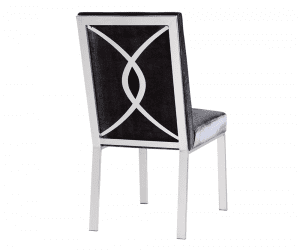 Upholstered in Blackwood Desert fabric. Featuring a swooping semi open back, this chic little chair provides comfortably stylish seating, suitable for formal or casual occasions. 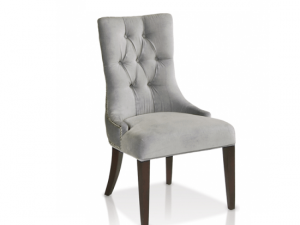 Upholstered in a Grey velvet fabric. 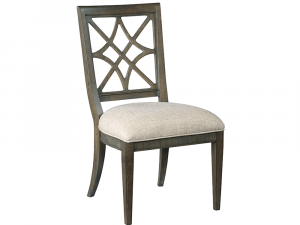 Satisfy your search for a simple yet tasteful dining chair, with this eclectic masterpiece. 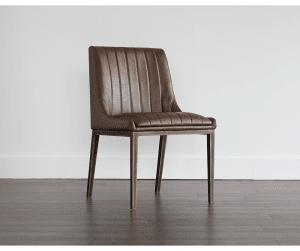 Top-grain leather seat and back. Charcoal Grey leather, Walnut stained legs. 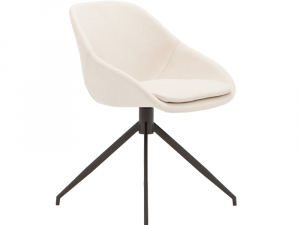 Available to order in-store with White leather and Espresso finished legs at no additional cost. 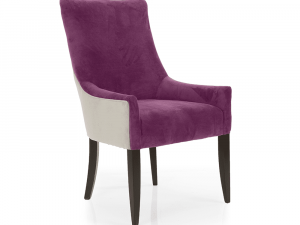 Perfect for semi formal and formal gatherings, this gorgeous velvet chair is a vibrant addition to any room; providing comfortably stylish seating. 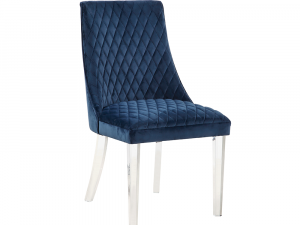 On display in-store upholstered in a luscious deep blue velvet. 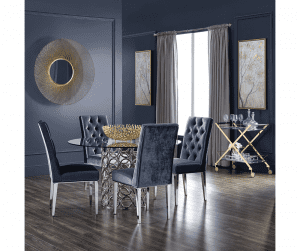 Shown here in charcoal grey velvet. Available to order in dark blue or charcoal grey velvet only. 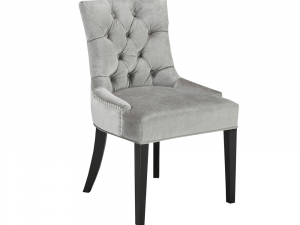 On display in-store in a charcoal grey velvet. 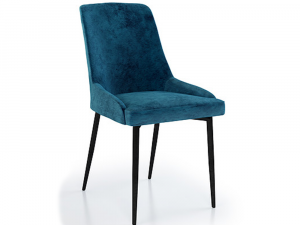 Shown here upholstered in a luscious blue velvet. 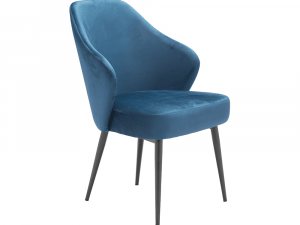 Available to order in deep blue or charcoal grey velvet only. Indicative of Coastal living, this hypnotic collection delivers Boho Chic styling, with ornate designs that capture the essence of a refined relaxed living space. Cushioned seat upholstered in a gorgeous Ash fabric. Wooden back featured intricate carved design. 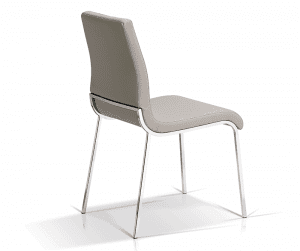 Available to order in saltbox white or oyster finish at no additional cost. Complete collection available to order in-store. Seat and back upholstered in a gorgeous Ash fabric. 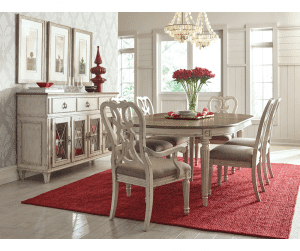 Features nailhead accents around the front legs. 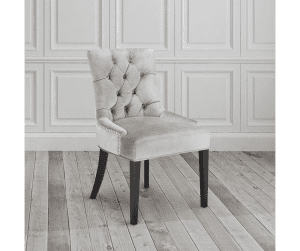 Available to order in saltbox white, cotswold blue or oyster finish at no additional cost. 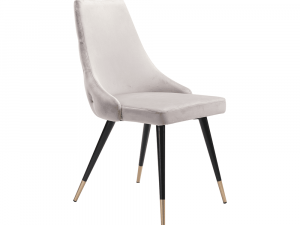 This daring piece is a true vixen of side chairs. 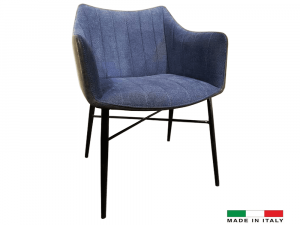 Featuring silky smooth fabric, with a gorgeous stripe pattern and accented by a dark brown finish, this parsons chair brings warmth, in colour and style, to any type of living space. Made in Canada. Available to custom order in-store in hundreds of different finishes and fabrics. 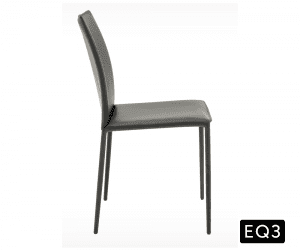 The Sleek High Back Side Dining Chair from EQ3 is a noticeable addition to any dining room. 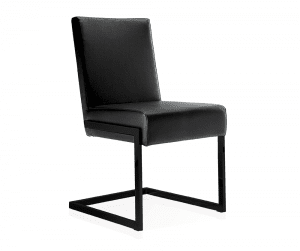 Simple and eclectic, featuring a Black Waxed Italian Bonded Leather seat and back and a durable metal frame with fire retardant foam cushioning, the chair will easily fill your seating voids. Available to order in black or white. 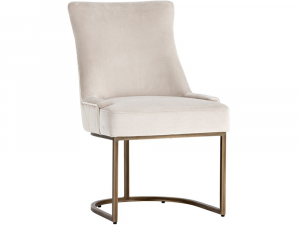 Soft and elegant, this stunning dining chair is a comfortable addition that lends chic style to your contemporary decor. 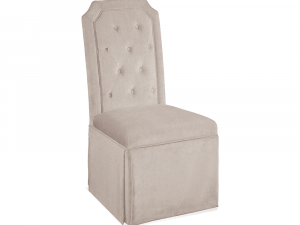 Upholstered in grey velvet fabric. 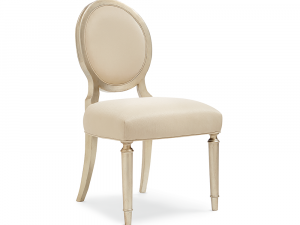 Also available to order in pearl fabric at no additional cost or as a white leatherette for an additional $100. 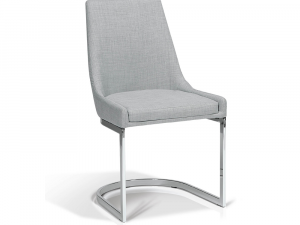 Featuring a rounded cantilever frame, constructed from steel and finished in chrome, the chair comes with a fully upholstered seat and back, in a refreshing keystone aqua fabric, over variable density foam, ensuring lasting comfort and durability. 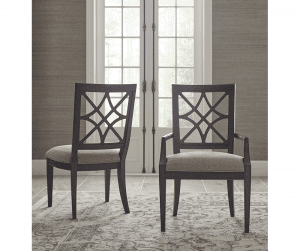 Available to custom order in keystone sand or keystone wood fabric, or in slate faux leather, all at the featured special buy price. 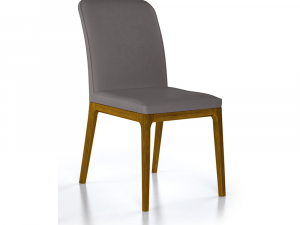 A fresh modern design takes precedence in this sleek armless dining chair, while subtle hints of retro style complete the contemporary look. 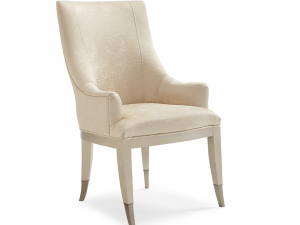 Upholstered in beige linen-like fabric with a beautiful self welt. 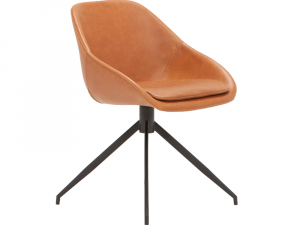 Available to order in brown faux leather. 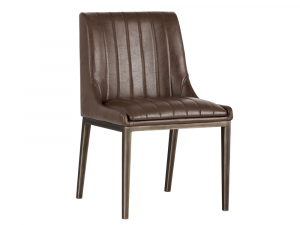 Upholstered in brown faux leather with a beautiful self welt. 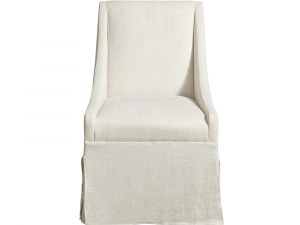 Available to order in beige linen-like fabric. 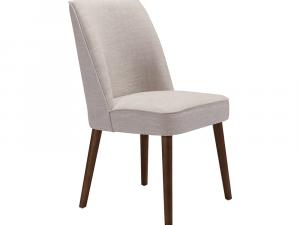 Featuring a sophisticated clean and simple look, wrapped in a classy Belgian Linen, this beautiful side chair is bold, a bit daring and has been adapted to fit modern home styling. 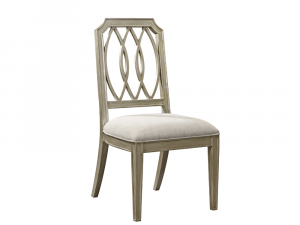 Lend you home transitional elegance with the beautiful features of this exquisite Dining Chair. 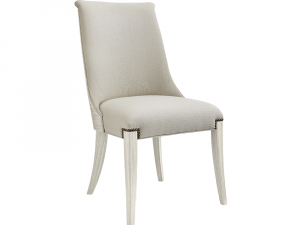 Beautifully sculpted seat in soft Prosecco fabric. 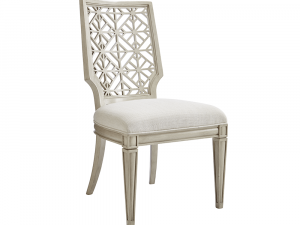 Diamond stitched pattern on the exterior seatback. 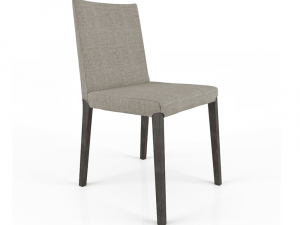 Available to order in Pebble Grey fabric at no additional cost. 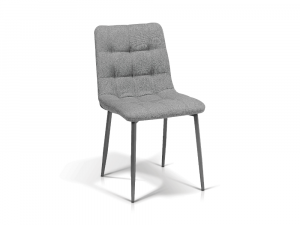 Beautifully sculpted seat in soft Pebble Grey fabric. 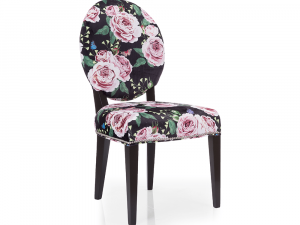 Available to order in Prosecco fabric at no additional cost. 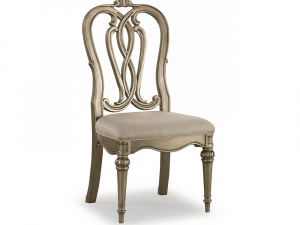 With a slinky lace inspired design on its back, this seductive dining side chair adds a sophisticated level of elegance to any dining room. 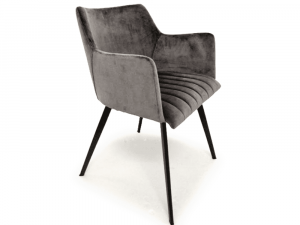 Upholstered Seat and back in Charcoal Velvet. Laser Cut Steel Detail on Back. 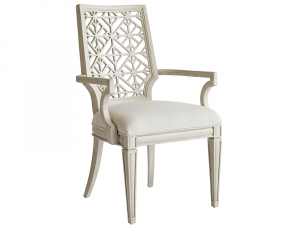 Inspired by Greek design elements, this gorgeous arm chair is an eclectic gem that can be used as a dining chair or accent chair. 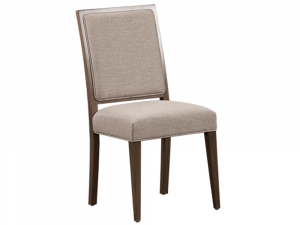 Graceful and confident, this beautiful dining chair is a comfortable addition to any contemporary or urban style dining room. 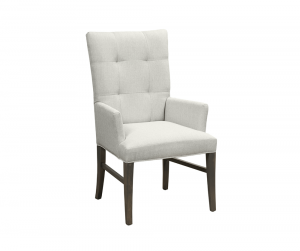 Upholstered in a neutral gray linen-like fabric. Available to order in emerald green fabric. 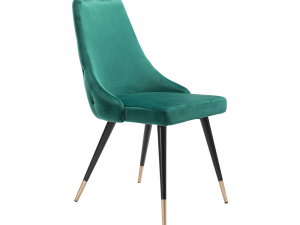 Upholstered in an emerald green fabric. 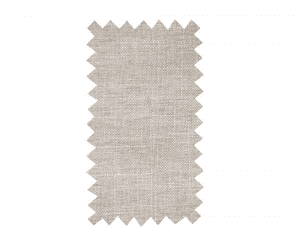 Available to order in grey linen-like fabric. Stunning and form-fitting by design. 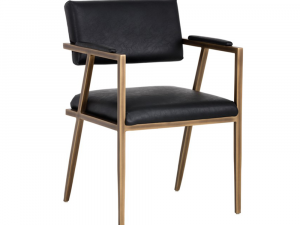 Practical by nature with a sophisticated look, the chair possesses distinctive features, including tufted seat, powder-coated grey metal legs, and refined keystone fabric upholstery. 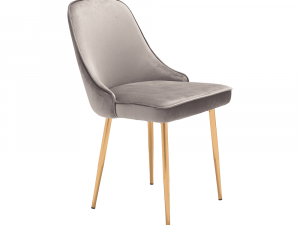 This fashionable Side Chair features a curvy and chic design, with perfectly proportioned wood legs and expertly tailored fabric upholstery. Select Hardwood solids, inlaid panels of cathedral elm veneer on inside back, overlaid with carved wood filigree on the outside. 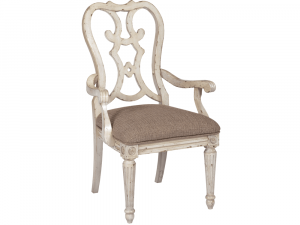 Wooden Back and upholstered seat with detailed nail head trim. 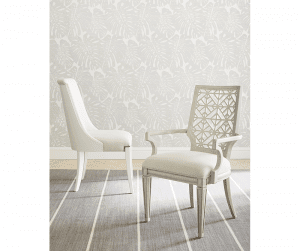 Available to order in Cirrus finish. Wood Back and upholstered seat with detailed nail head trim. Available to order in Parch finish. 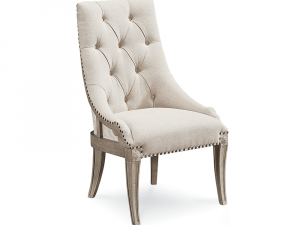 Upholstered with printed fabric, Button-tufted and detailed with nail head trim. 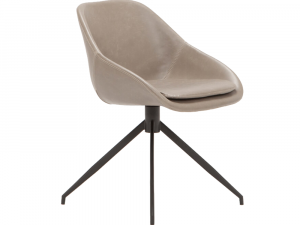 Available to order in Dark Grey or Light Beige Fabric, Brown or Grey Faux Leather; and as an Office Chair, at no additional cost. Soft gold wonderful frame in teal blue velvety fabric. 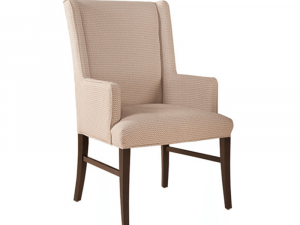 Remarkable, comfortable little tub chair that adds panache wherever it goes. 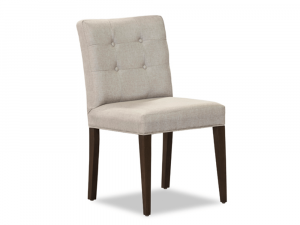 Versatile as a dining chair, bedroom vanity chair or hall accent. 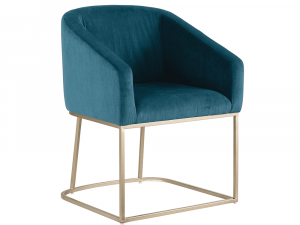 Dark teal fabric, steel metal frame. Available in dark teal or fog grey fabric. 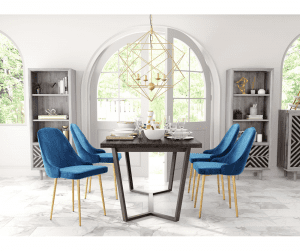 A chic addition to any modern or contemporary home, this gorgeous dining chair features a tufted back, making it suitable for all gatherings; from casual to formal. 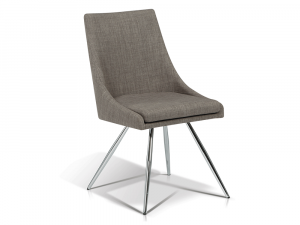 Accent metal ferrules on legs. Available to order in grey, green or pink velvet. 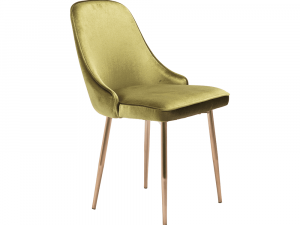 Upholstered in Green velvet fabric. 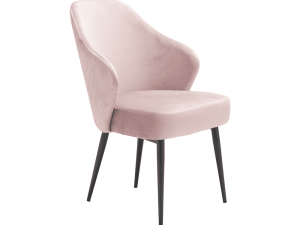 Available to order in Grey or Pink velvet. Upholstered in Pink velvet fabric. Available to order in Green or Grey velvet. 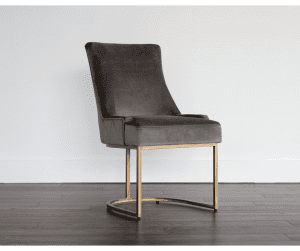 Industrial meets transitional charm in the evocative mid-century modern styling of this sleek armchair. Available to order in vintage beige fabric at no additional cost. 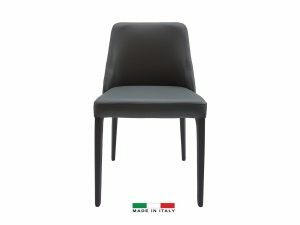 Crafted in Italy and finished in Canada, this sleek chair is an eclectic piece that can be used for any casual or semi formal occasion. 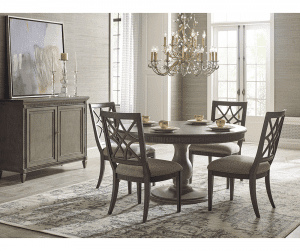 Pairs perfectly with the Helene Dining collection. constructed with solid Beech wood. 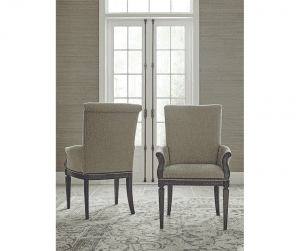 Alternate finishes and fabrics available at no additional cost. 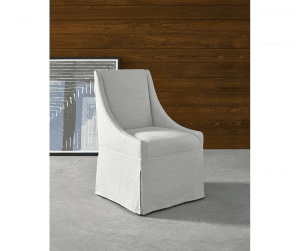 This simple and satisfyingly comfortable chair features soft fabric upholstery, birch wood construction and a beautiful finish that easily fits with a variety of home decor styles. Featuring a supple Ivory cover with a tufted back, and solid wood legs in an espresso finish, this dining side chair is an effortless way to add a splash of chic style to your home. 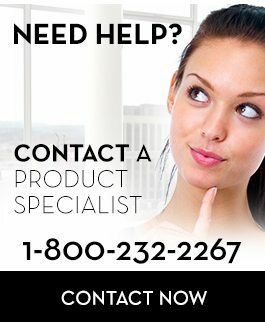 Please call, email or visit us in-store to ask about customization options. Enhance the your dining experience, with the stunning attention to detail and stand out design of this stately chair. 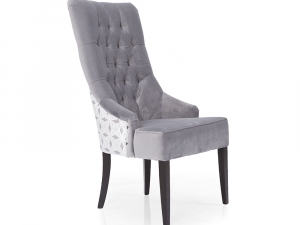 Fully button tufted grey cushioned seat and back in charcoal Velvet fabric. 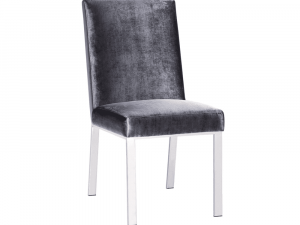 Available to order in Charcoal Velvet, Light Grey Velvet, Platinum Velvet fabrics. 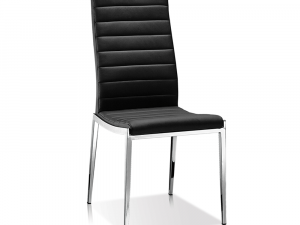 Also available as a white leatherette or Black Leatherette. Putting a new age spin on a classic retro design, this funky dining chair offers sleek modern appeal, suitable for any modern or contemporary living space. Available to order in Pink or blue velvet. Available to order in Green or blue velvet. 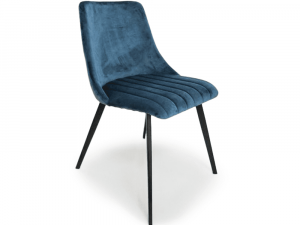 Upholstered in Blue velvet fabric. Available to order in Pink or Green velvet. 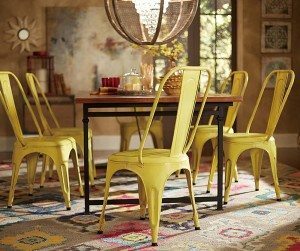 Sleek and modern, with a touch of retro style, this chic collection of stools and chairs are the perfect fit for any dining occasion. 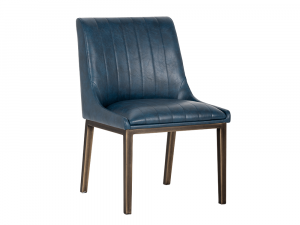 Upholstered in Blue PU Leather. 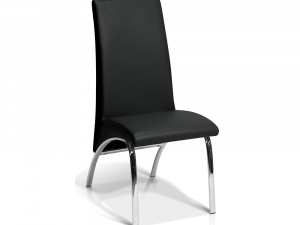 Available to order in Black PU Leather or Graphite Fabric. Also available in White Oak finish. Love your chairs. 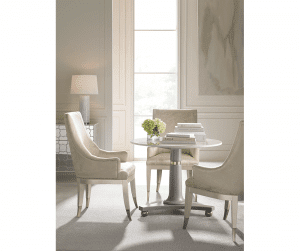 Versatile and modern, these side chairs can complete any dining room successfully. 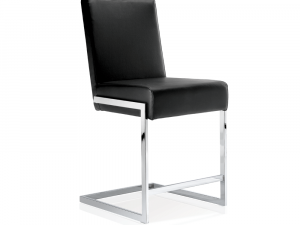 Featuring a black faux leather cover and a chrome finish, the counter stool is available at a special price while quantities last! 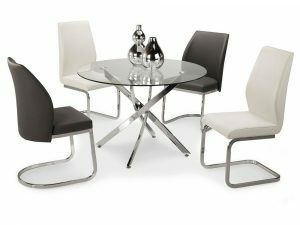 Available to custom order in-store with your choice of dining, counter and bar height options, in alternate leather covers and finishes. Also available in grey nylon. 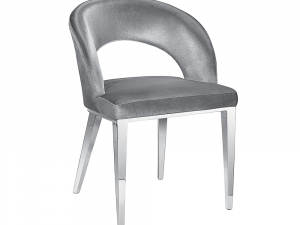 Featuring a grey fabric cover and a chrome finish, the chair is available at a special price while quantities last! 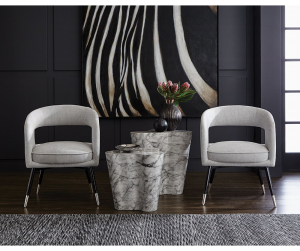 Available to custom order in-store with your choice of dining, counter and bar height options, in alternate fabric or leather covers and finishes. 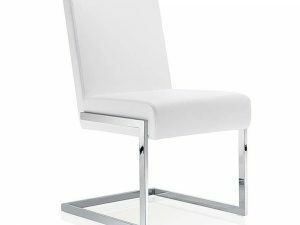 Featuring a white faux leather cover and a chrome finish, the chair is available at a special price while quantities last! 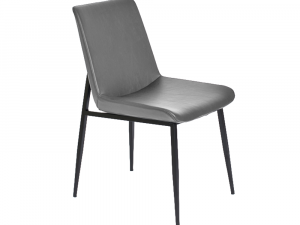 Featuring a dove grey faux leather cover and a chrome finish, the chair is available at a special price while quantities last! 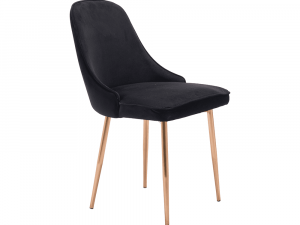 Defined and sleek, with its low back and swooping back legs, this gem of a chair offers soft support, ensuring increased comfort; and can easily complement any type of decor. 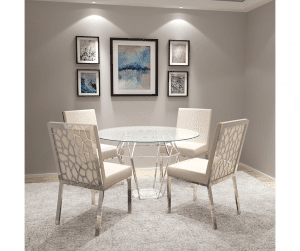 Elegantly poised, this beautiful dining chair bares a simple design, while delivering a big impression on your existing decor. Available to order in Black, Grey, Green or blue velvet. 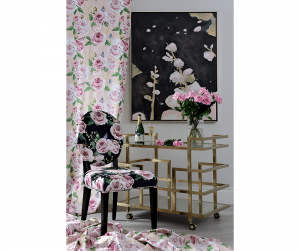 Upholstered in a Black velvet fabric. Available to order in Pink, Grey, Green or blue velvet. Available to order in Black, Pink, Green or blue velvet. Upholstered in a Green velvet fabric. Available to order in Black, Grey, Pink or blue velvet. Upholstered in a Blue velvet fabric. Available to order in Black, Grey, Green or Pink velvet. 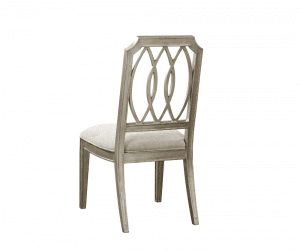 Elegantly designed this stunning Dining Chair features an ornate pattern on its back, precision cut out of metal, offering a seat that can be seen as formal or casual. 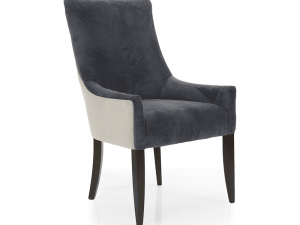 Upholstered in a charcoal velvet fabric. Laser cut metal detail on back. Available to order in alternate finishes fabrics and leather covers. 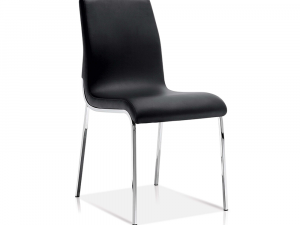 Featuring a design that won’t go unnoticed, this sleek and impressively comfortable chair will fit right in to your existing decor. Crafted with a metal base. 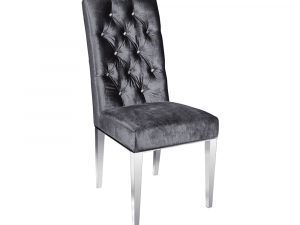 Upholstered in faux black leather. 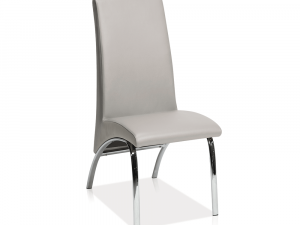 Available to order in black, white and dove grey faux leather. 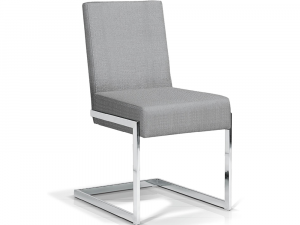 Also available to order in Counter Stool height and Bar Stool height. 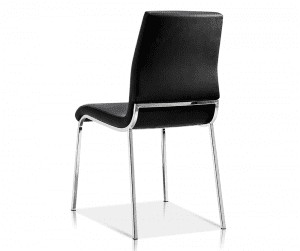 Featuring a design that won't go unnoticed, this sleek and impressively comfortable chair will fit right in to your existing decor. 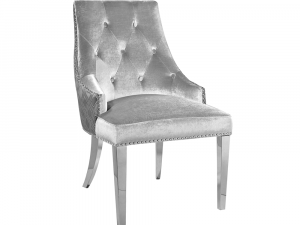 Upholstered in faux dove grey leather. 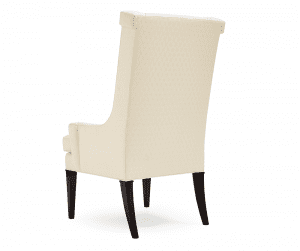 Upholstered in faux White leather. 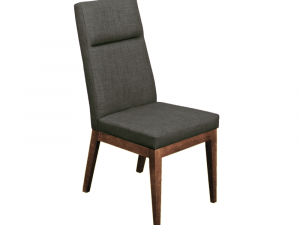 Say hello to this clean, Canadian made, simple solid birch dining chair. 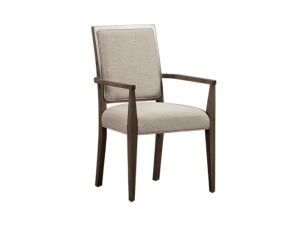 Featuring a rustic mocha finish, complemented by a supple linen fabric, the chair offers comfortable padding and a perfectly eclectic, succinct design. Available to custom order in-store in alternate finishes and hundreds of fabrics at no upcharge. Also available in Walnut wood for an additional $100. 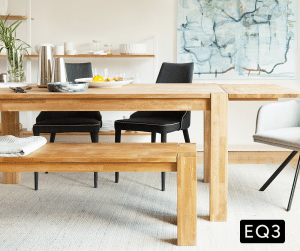 Tailored lines and sleek upholstery give The Valentine from EQ3 a sophisticated aesthetic. 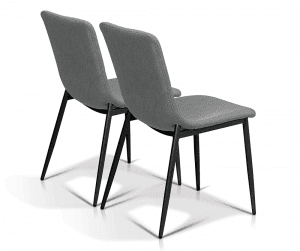 Featuring a Luxurious grey fabric and black finish legs, the high back and squared arms display sharp slightly broken corners, adding visual intrigue and providing comfort; while the light self welt detail adds a sleek touch. 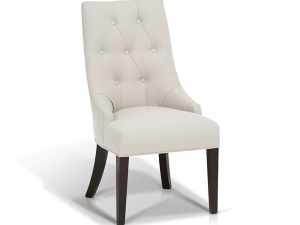 Tailored lines and sleek upholstery give this chair a sophisticated aesthetic. 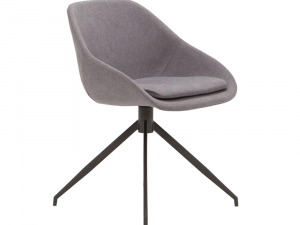 The high back adds visual intrigue while providing comfort. The light piping detail adds a sleek touch. 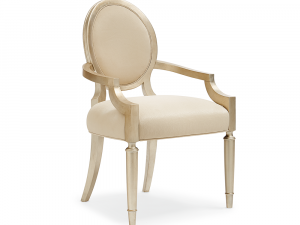 Mix and match the Valentin side and arm chair for your ideal look. 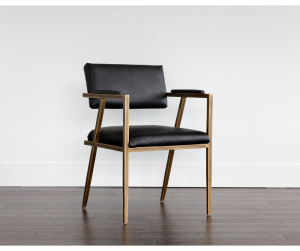 Tailored lines and sleek upholstery give The Valentine from EQ3 a sophisticated aesthetic. 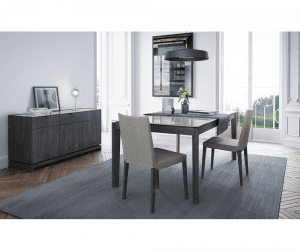 Featuring a Luxurious grey fabric and black finish legs, the high back adds visual intrigue and provids comfort; while the light self welt detail lends a sleek touch. 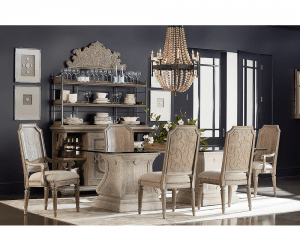 Featuring a transitional design that exudes sophistication and elegance, this stunning collection will either embellish your existing decor, or set the tone for a new and fresh look. 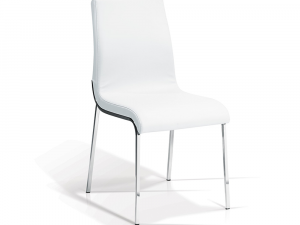 This trendy dining chair features a supple fabric cover that lends a lovely splash of colour to the room. Upholstered in a teal velvet fabric. Framed with steel powder coated legs. 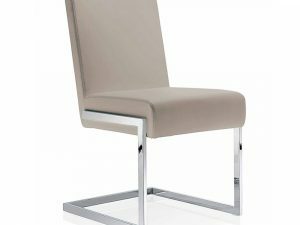 Available to order with grey velvet or grey leather at no additional cost.